While playing a little bit with paper, I started playing with the water bomb base. I then moved into the frog-base (I think) whice has some potential for bugs: 4 long limbs, elongated body, and four shorter flaps. These two critters look moderately bug-like. Note that the left one has these two fins at the side – those are two of the flaps. One other is the head. I had another piece of paper which is now fubar (folded up beyond all recognition) of the same fold, which resembled a human being. I’ll probably be playing with this fold some more, while looking for minimum cuts (in graphs) and writing a compiler (for cpl). This entry was posted in Origami and tagged Bug, Origami. Bookmark the permalink. I was wondering if you have a picture showing me how to fold one for myself step by step. 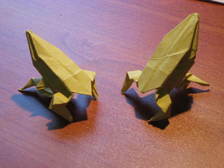 I wrote the instructions for the “fat spider”, which is based on this fold.